There’s something very different about Saint Andrew Catholic School in Newtown. The faculty and school leadership foster it. So do the community of parents and alumni, both of which remain highly engaged with the school. And the students of this Catholic elementary school and preschool live and breathe this difference on a daily basis. 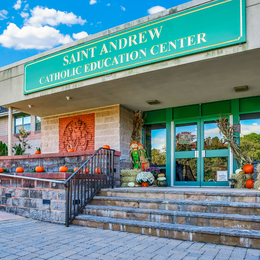 The Sisters, Servants of the Immaculate Heart of Mary founded Saint Andrew Catholic School in 1927, and the school has been imbuing students with strong moral character and other vital life skills ever since. To build on its rich Catholic history, the school is constantly pursuing more “creative ways to inspire reverence,” as Matteo puts it. In December, for example, students participate in a living nativity. On Thursday mornings, seminarians from Saint Charles Borromeo Seminary—the seminary of the Roman Catholic Archdiocese of Philadelphia—come to the school to offer Adoration. Other examples include frequent liturgy celebrations, weekly class masses, and monthly religious celebrations for the entire school, as well as visits to the school’s Chapel of the Holy Family. Jessica Wagner “loves” teaching at Saint Andrew for many reasons. The school’s commitment to nurturing each student’s spirituality may be what she appreciates most about the school. While faith and character are paramount, Saint Andrew aims to develop the whole child. A rigorous academic program, which includes world language lessons for every grade, from pre-K through eighth, has helped prepare Saint Andrew students for the challenges ahead. As a result, Saint Andrew has earned a prestigious distinction: National Blue Ribbon School status, awarded for overall academic excellence. When graduates return to Saint Andrew for a visit, Matteo usually leads with a question: “Were you prepared for high school?” She says they usually answer with a resounding “yes,” adding that they were far more prepared than friends who went to other elementary schools, especially in regard to technology and writing. To her point, technology abounds at Saint Andrew, ranging from SMART Boards and Mondo Boards in classrooms to a one-to-one program whereby every student in grades five through eight receives a Chromebook. In addition, students in lower grades can access Chromebook and iPad carts through “SWAT,” an acronym for Students Working Around Technology. Saint Andrew prepares its students for the future in other ways, too. In addition, the school has a financial literacy program with a branch of The First National Bank & Trust Co. of Newtown in the building. Open to students (and employees) every Thursday, this unique program enables students to begin thinking about the mechanics of saving and spending at an early age.